First we want to thank those of you who were concerned for our well-being with the recent horrific Hurricane Harvey, that hit South Texas and flooded Houston and the surrounding area. Thankfully as we live 180 miles north of Houston we were not affected, although many of those evacuated from there have come to East Texas. It is amazing how so many have been involved in helping in one way or another – from individuals going down to cook hamburgers, to farmers opening up pastures for evacuated livestock, and hundreds of work teams and truckloads of supplies going down to help, although it will take a long time to recover. Now we are praying for those affected by Hurricanes Irma and Maria! The past few weeks have been busy with news from our partners in Africa, but as is so often the case, great answers to prayer are sadly often followed by less encouraging news, but God is still on His throne and our prayers continue to be both needed and valued! We praise God for a wonderful answer to prayer in the generous donation from one of our supporting couples who sent $800 to pay for the JP orphans to attend school again this year. 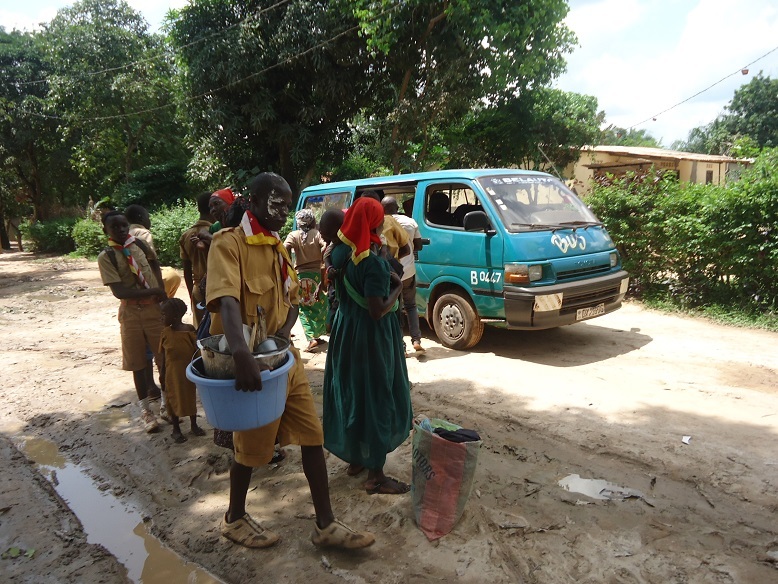 In Togo the government supplies the village school building and assigns teachers, but the only pay they receive is what the villagers give them! So each student has to pay a tuition fee, as well as supply their own books and uniforms etc. I knew the need for this was great, as shared in last month’s newsletter, but I was unaware of the deadline for the students to pay. I immediately e-mailed Pastor Sika with the great news, and he replied that as he did not have any money for the schooling he had had no idea what he would do. The previous day he had finally given the burden up to God as it seemed impossible! PTL we have sent the funds and the school supplies are being distributed as I write. God is awesome! Thank you ALL for your faithful prayers and support. Blessings, Gerald and Shirley. 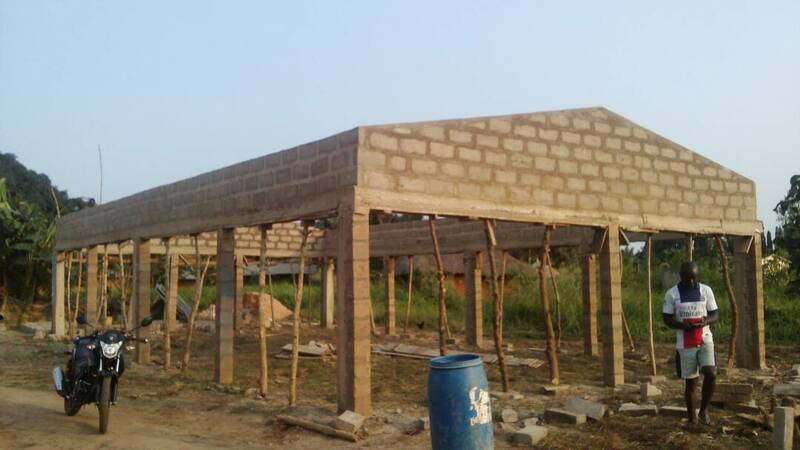 Pastor Sika in Togo also tells us that the roof support on the new church building of Bethany Baptist Church in the Joseph Project compound has been constructed (as seen in this picture), but the cost ended up double what the local donors had expected. As a result some $2,000 is still needed for the actual metal roof and enclosing of the sides for the church to be complete and secure. But the rain finally stopped and so the new bathroom block is well underway as seen in this picture (right). It’s actually a big undertaking but hopefully soon will be finished and in use. Another piece of great news is that Pastor Sika would like to use one of the rooms in the new office building for a nurse to come and use as a small clinic for both the orphanage and village and surrounding area. The patients would be charged a small fee for the services but it would be wonderful as medical teams have only rarely visited the area. He has talked to the government (as he is trying now to get official recognition for the orphanage) and they seem willing to provide a nurse and the supplies as long as the nurse can live in the village and Pastor Sika signs a 5 year renewable contract. He says the procedure is a bit long and costly though, so he is praying about it. So the vision for the Joseph Project continues to grow and it has the potential to have quite an impact on the whole area for community development as well as the Gospel. Much to pray and believe for – and especially for Pastor Sika’s health, protection and wisdom as he makes decisions. He also just told us that 100,000 people marched recently in Lomé asking for true democratic elections, as the same family has been in power for decades. As a result the government basically shut down the country’s internet! Pastor Honoré in C.A.R. was one of four main speakers at a huge national youth camp recently with 2,000 young people from all over the country – sponsored by the government but organized by churches! 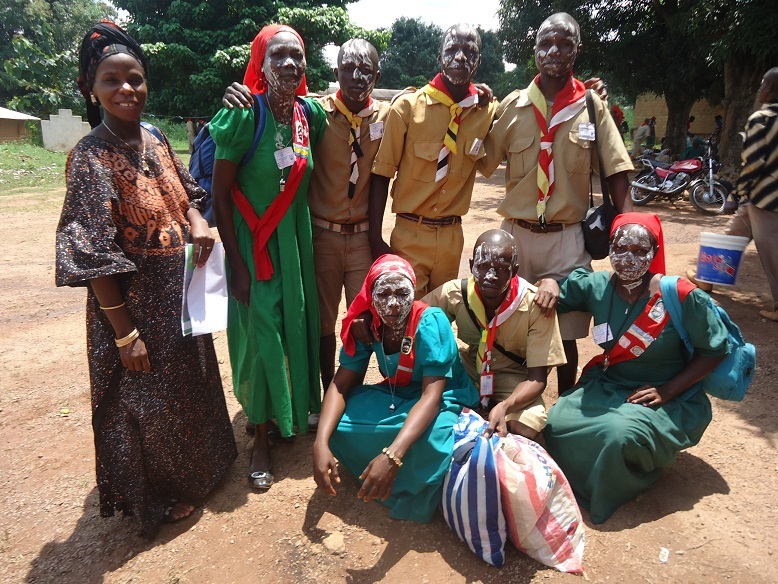 This photo shows some of the campers from his church (sorry but I don’t know the significance of the white mud on their faces!). The second photo shows the campers waiting for transportation home. 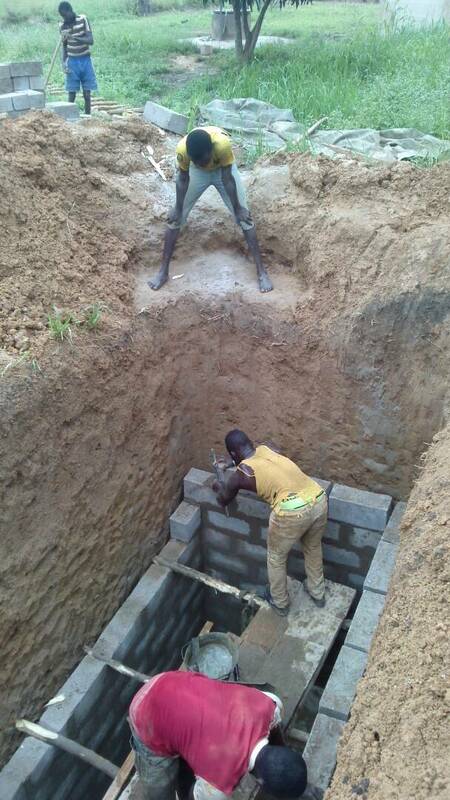 He plans to hold a seminar for children’s ministry soon at the CEERCA camp….He is still in touch with Water for Good, and they are still prepared to drill a water well on the site for the church and local community, just as soon as he can build a small house on the site and get a guard and watchman over the well. He is praying for the funds to be able to do this and also find the right person committed to this responsibility. 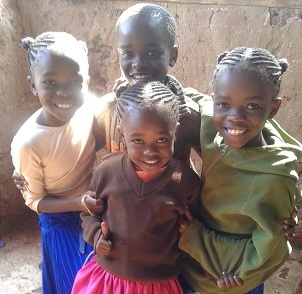 Mike in Kenya – is preparing to help with a big children’s ministry conference Sept 20-21 organized by a teacher from a UK ministry called Children Worldwide. 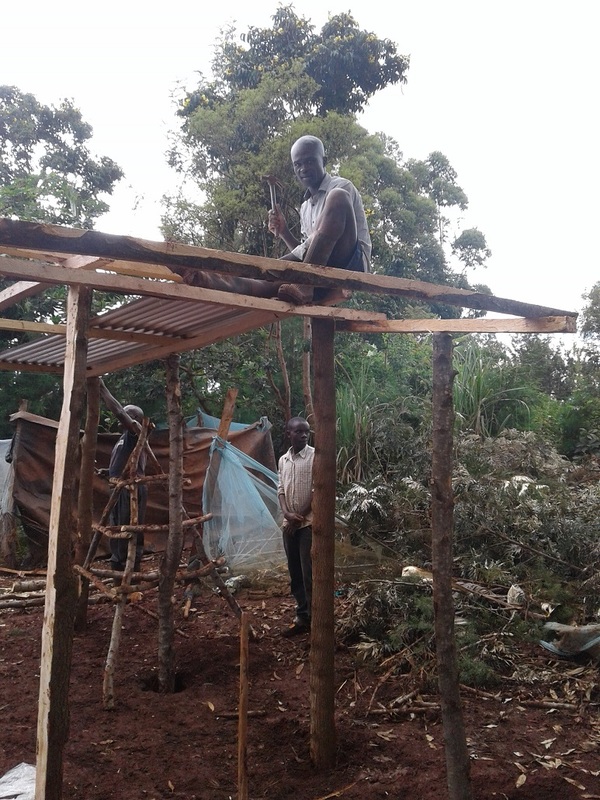 He is also helping his wife, Irene, by constructing a new little building for her business on their property (that’s him on the roof in the photo below!). For years she has had a little shop selling snacks and drinks to passers-by, especially the many school children who walk up and down the road. With the larger shop Irene will be able to also sell clothes and other needed items. We pray the Lord will truly bless this enterprise. 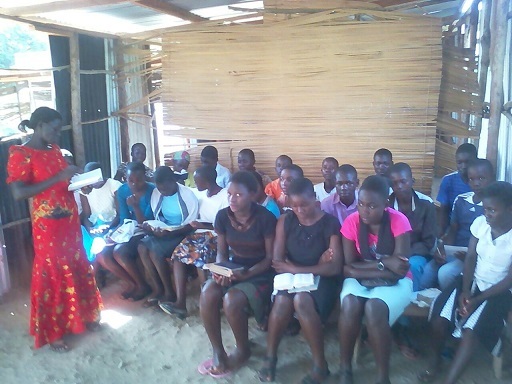 School recently started back there in Kimilili also, along with organizing new school bible study groups. The 2nd picture shows teen ministry in a local church there with one of his coworkers, and the other picture shows Mike’s four precious children.